Several elementary school students in Gainesville, FL were sent home on the very first day of school last week for violating the school's dress code policy. 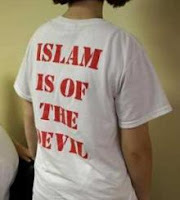 It seems that these children (one only 10 years old) wore a T-shirts imprinted with the slogan “Islam is of the Devil” to school. Their church decided that this would be a good outreach ministry to the school community. The children weren’t suspended; they were simply sent home to change into more school-appropriate clothing. Have you ever wondered if it would be much easier to teach people about Christ if it weren’t for some Christians? Come on! Did the Dove World Outreach Center (the church that produced the T-shirts) really think that anyone is going to be positively influenced by such a stunt? Is anyone going to say, “Hey, I wondered where Islam came from, but now I know it's from the devil because it says so right there on that T-shirt?” Did Paul go to the Areopagus in Athens to speak to pagans wearing a “Zeus of is the Devil” toga? Do people really think non-believers will take Jesus MORE seriously because people send their kids to school with T-shirts denouncing other religions? All that sun in Florida must be baking people brains. Whether we like it or admit it or not, we live today in a multicultural world-- the same kind of world that Paul lived in. It is a world in which every truth is accepted and no truth is accepted, a world where there are many gods and no god at all. In our world, Christianity is just one idea in a marketplace of ideas. Sure, Christianity is different-- it happens to be true. But if we want non-Christian people to ever accept Christianity as true, then belittling other beliefs is the absolute wrong way to go about it! On the Areopagus, Paul was actually rather complimentary and showed a great deal of respect in sharing the gospel with pagan professors (See Acts 17:22-31). Gentleness and respect. Good behavior. Reason for the hope you have. These are the things that will cause others to respect what we believe. If our Christian faith doesn't work in making us better people, then why should non-Christians believe it anyway?